A lot was going on at the Fairchild Farm & Garden Festival. Here’s another post from the Festival, about growing your own oyster mushrooms. On Saturday April 24th, Gabriele Marewski and Drake Kurlander of Paradise Farms were set up for a talk on her oyster mushroom operation. “Growing mushrooms is an art and a science,” Gabriele said as she introduced Drake, an FIU student with a passion for mushrooms. He works closely with Benjamin Masope, the mushroom expert from Ghana who is responsible for successfully starting Gabriele’s mushroom production. (You can read more about his story in the April issue of edible South Florida.) Here are my notes from Drake’s presentation. “Anyone can grow mushrooms once the process is understood,” Drake said. He went on to explain the life cycle of mushrooms. You start with spores, which germinate, grow in substrate and result in the fruit body, or edible part of the mushroom. Spores are in the air everywhere. Spores are both male and female, and once they germinate, they make a simple structure called hypha that replicates itself, combines, and creates a network called mycelium. This network colonizes, and two and a half to three months later, produces pin or baby mushrooms. From that stage, it takes only two to three days for a pin mushroom to grow to full size. A full grown fruit body (as the edible part of the mushroom is called) has a hollow structure full of spores, and it can reach out and put spores in the atmosphere. A fruit body will also grow by cloning. You can sever it and put it in substrate (special growing medium) and it will expand. The production process on the farm follows a specific process. The growers start the spore culture in a petri dish. Next, they sterilize grain (they use organic chicken feed at Paradise) under high heat and crush it. The grain, or primary substrate, is inoculated with spores and incubated in jars. While it’s growing, Drake and Benjamin mix up the secondary substrate — a top secret formula! — and put it into bags. Those go in the pasteurizer which cooks the substrate at a high heat to kill any wild spores which might dominate the mushroom spores. The spawn is then inoculated into the sterilized substrate and left to grow in a chamber which circulates humidified air. 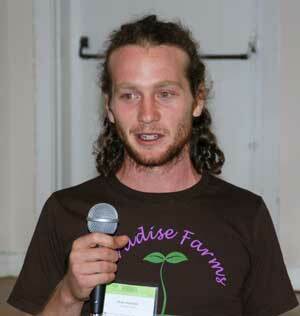 “The challenge is to maintain sterility in the grow room,” Drake explained. “Air has fungi and contaminants floating in it.” Currently they are harvesting 200 to 300 pounds a week, and want to increase production to 800 pounds a week. Oyster mushroom starter kits. 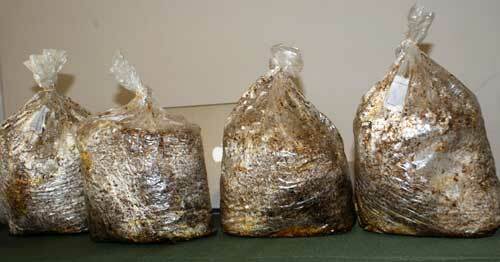 Each bag of substrate is inoculated with mycelium. Just add water and light, and wait for signs of growth! The starter kits are available for $40. Each bag or inoculated substrate will last for about four to six months of growing, and you can harvest six to twelve pounds of mushrooms from it. Gabriele pointed out this is a pretty good deal, since mushrooms retail for $10-12 per pound. You can order a mushroom growing kit from Paradise Farms, and pick it up from Benjamin where he works at the Crackerman booth at the Coconut Grove Farmers Market on Saturdays.